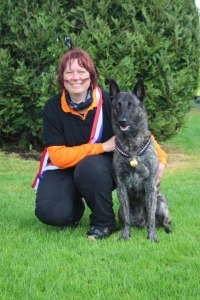 The 1st World Championship IPO for Hollandse Herders (Dutch Shepherds) took place in Hoogkerk/The Netherlands on May 10th and 11th, 2014. Hondensport Hoogkerk (Dogtraining Centre Hoogkerk) had offered to host this event and the WDSF had accepted that offer gladly. Participants and spectators werd looked after perfectly by Jose Stienstra and her team. Offering help, advice and care to people where wanted. The atmosphere was friendly, it felt like a big family, This was certainly reflected in the party’s attendance. 23 Teams from 8 different countries entered the competition, 22 teams with a shorthair and 1 wire-haired combination. 19 Combinations competed in the IPO III class. The field was wide and the quality high. Andrea Manthey with her Bull; Boyd’s Bullriding Glenmore came in 1st, with a total of 294 points out of 300. They were rewarded the special price, the Goldmedal. 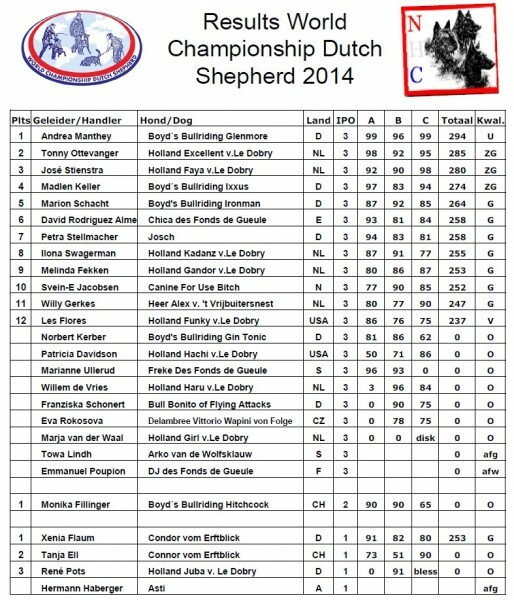 Jose Stienstra with Holland Faya v. Le Dobry came in 3rd with a score of 280 points. Team Germany became the 2014 Champion. Pictures of the 2014 World Championship can be found on this page. Next IPO World Championship will be held in Falkenberg / Sweden May 1st till May 3rd 2015.